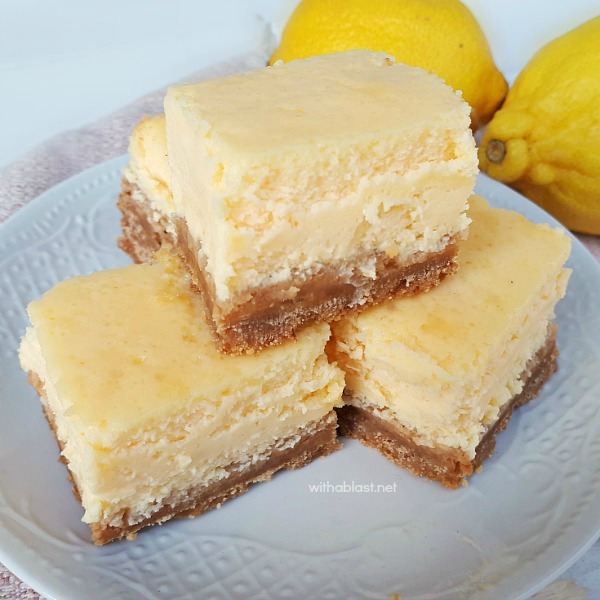 I have been making these light Lemon Cheesecake bars for years now. And recently my son mentioned that it had been some time since the last batch I baked. 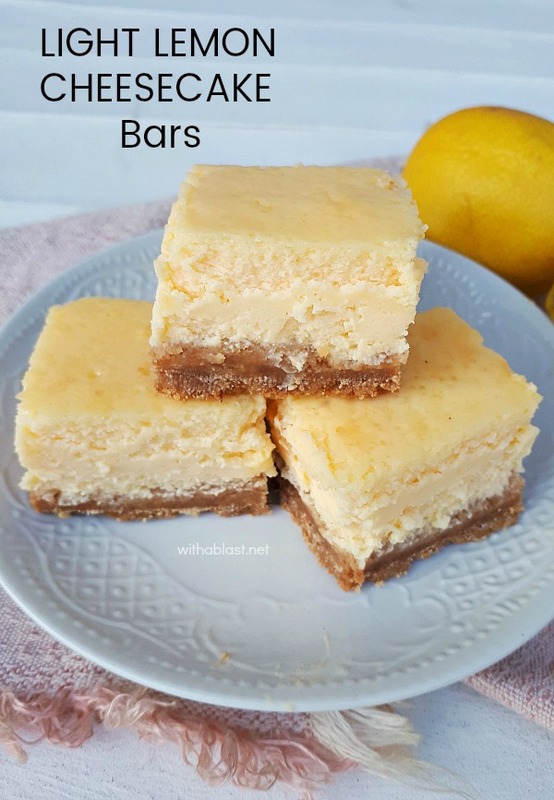 My family, especially the kids, absolutely love these Cheesecake bars and I should really make them more often. But, when I checked the blog (I like to update my photos every now and then), I could not find the recipe here ! Totally weird as this is the number one dessert in our house, even though I need a gentle prompt to make them. 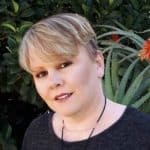 Never mind that it is such a simple and easy recipe too, as that is what With A Blast is about – mostly quick, easy, delicious recipes. If Cream Cheese is a standard pantry (refrigerator) ingredient in your kitchen as it is in mine, you might already have all the ingredients on hand and you can start baking up a batch. 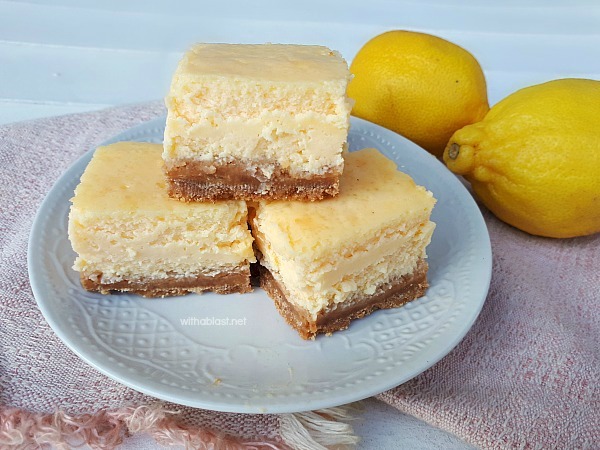 There is of course nothing better than freshly squeezed Lemon juice to use in this recipe. But if you really crave these and you only have bottled Lemon juice, that works too ! The Lemon flavor will be a little less intense, but I know first hand what people will give up once a craving has flared up ? You might also want to finely grate the Lemon rind (of one Lemon) and add that into the mixture which makes it more tart. 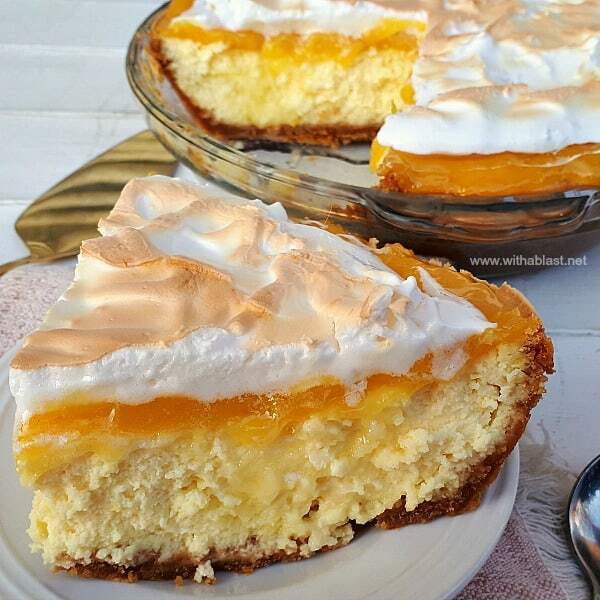 Due to my family’s dislike of Lemon rind mixed into the creaminess, I always leave it out. I did add rind once, but was subtly asked to please not to do that again ! 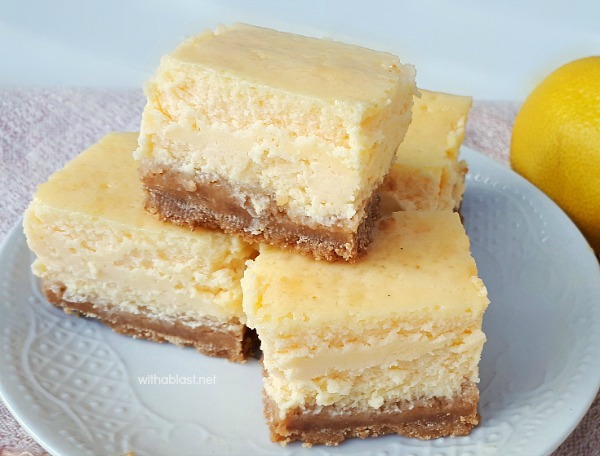 Which is why I call this a “Light” Lemon Cheesecake as there is only a hint of tartness. Slice into bars and serve – keep leftovers in a sealed container in the refrigerator.